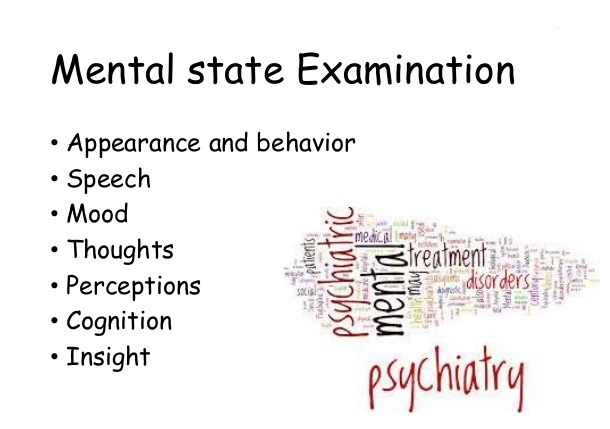 This assesses state of mind at the time of interview with the patient. A true description of mental states entails valid knowledge about current emotions plus their reactions to those emotions. Take notes under the following headings. • Appearance and behavior: see for signs of self-neglect; slowness, anxiety, or suspiciousness. • Mode of speech: Speech rate, eg gabbling (pressure of speech), or slow/retarded. Note content. laughter and grand ideas of manic patients are contagious, as to a lesser extent is the expression of thoughts from a depressed person. (delusions) eg that thoughts are overheard, and ideas (eg persecutory, grandiose). experiences; have you heard anything unusual recently?” Note modality, eg visual. it morning or afternoon? What is your name? • Short-term memory: Recall a name & address 5 minutes after learning it. Ensure he really has learned it before waiting for the 5 minutes to elapse. • Concentration: Months of the year backwards. 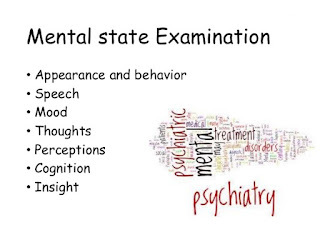 • Patient’s insight and degree of your rapport. • Body attitude (eg ‘defensive’). • Do you feel anyone is controlling you? • Is anyone putting thoughts into your head? • Do other people access or hear your thoughts? • Is anyone harming you? • Any plots against you? • Do you hear voices when there’s no one nearby? What do they say? Echoing you? Telling you off ? • Do you see things that others cannot see? • Is life worth living? • Can anything give you pleasure? • Sleep and appetite ok? • Energy levels increased or decreased? • Can you concentrate ok? • Are you feeling guilty? • Is your confi dence low? • Are you wanting to harm anyone? Yourself?